The rule of thumb says that you need a minimum range of 25 kilometers (or 15 miles). Any lower and you will be quite restricted. Having said that, try to buy an electric bike that offers more range than you actually need. That way, you won't have to worry about it. Amp-hour is a fairly straightforward metric, but it doesn't tell a lot about the mileage range. After all, we don't want a 10 Ah battery, we want a 25 kilometers range. But, measuring the range that an electric bike can cover is pretty tricky. Many ads publish the magic number of 30 kilometers or 20 miles. Most of these advertised ranges are seriously off target. The range stated is usually in the most perfect of conditions (if measured at all), which is usually worked out in a lab. The actual range is going to vary greatly from rider to rider, condition to condition. There are hills, bumps, mud, snow and many other surface types in the real world. Add to this - your weight, your e-bike speed, your luggage weight, and the number of stops & starts. How much you are willing to pedal also has a very big effect on the range, and we didn't even start talking about the motor efficiency and the battery type. Why does range is so important? You should have enough range for all of your commuting. Should it be grocery shopping, a weekend trip or visiting a friend. You shouldn't be restricted by the battery capacity. You should have fun, feel free. You need to know that you can pedal if you want but it is not a must and you have to be sure that your e-bike has enough juice to take you back home. Electric bicycles are about extending the distance people can go with their bicycles. They enable more people to use and enjoy bicycling for various activities which weren't possible for them before. Also, many cyclists dream about covering a very long range at least one time in their life and the e-bike can give them the option to accomplish just that. Electric bike range, speed and cost are moderate. The moderate weight and speed enable the reasonably high range. Higher speeds will make the range significantly shorter. Speed and range are not proportional. Meaning, increasing the speed by a certain percentage will results in the range decreasing by more then that percentage. There as to be a balance between the motor power and the battery capacity. You can't install a big motor with a low capacity battery. An e-bike with 1000 W motor power and only 9 Ah batteries won't take you too far. And you probably don't want to increase both the battery and the motor too much, because then your electric bike will turn out to be a lousy electric motorcycle. Such an e-motorcycle will need better suspensions and racks. It will need insurance, taxes and other sort of licenses. You would also loss all the bicycling experience. You can use the calculator to find out more about the balance between weight, motor power and battery capacity. Most power is drained when moving off from stop and when going up-hills. Pedaling at these points will preserve a lot of motor power. You can reduce the e-bike weight and save a lot of money if you can accept the fact that e-bikes are here to augment your power, not the other way around. In general, motors with a higher nominal power rating may offer more hill climbing ability (torque) but will reduce the range. With most Pedelecs, you can choose the level of motor assistance. The level of assistance is set as a percentage of the overall power. If you choose 25% assistance, for example, the motor will give you a quarter of the power which you are producing with your legs. A torque sensor measures how much strength you're putting into your pedaling and provides an appropriate amount of supplemental power. In some systems, the level of assistance goes down as the speed goes up, until it cut completely when you reach the highest speed permitted by law. With throttle based e-bikes, you can pedal or not. The motor power is solely determined by the throttle. Many cheap throttle e-bikes come with an on-off switch. The motor will waist a lot of energy on such e-bikes and your pedaling effort will have just a marginal effect. But, there are throttle systems that can be set to different modes, such as: Economic, Normal and Full Power. Economic puts more emphasis on pedaling, while Full Power gives your feet a rest and kicks more power. The overall distance is affected by the selected mode. Two hours at Full Power can turn to even six hours in Economy mode. 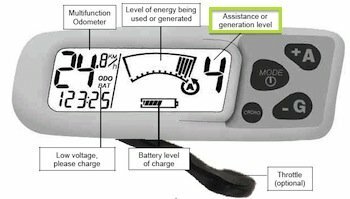 The level of assistance is of prime importance when calculating the e-bike range. So be sure you understand what was the assistance level during any range test. Also, when comparing different models, the level of assistance should be the same. Basically, if you want a bigger range you would have to get a bigger battery (or pedal harder). However, batteries are not cheap, especially the more advanced ones and they are not light either. When selecting an electric bicycle you need to consider weight seriously. Range and speed are important; but they come at the expense of greater weight. Usually, if you want a bigger range, you have to purchase an additional battery and carry it in your bag while riding. When the first battery stop pulling you, you have to switch batteries. It's not so convenient or efficient. 1. Giant came up with the Twist e-bike. 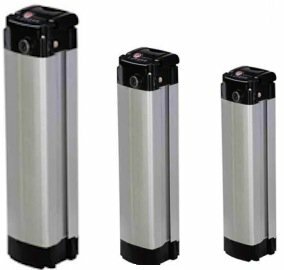 It has the ability of carrying two functional batteries with two separate power meters. So, instead of swapping batteries, you can just switch between them to choose which one to pull power from. In that way, you can avoid draining the battery completely. 2. PowaCycle offers e-bikes with the stackable batteries. You can connect a couple of batteries together to get the desired range. In that way, you can carry just the right amount of capacity to any of your trips. You will probably use just one battery for most of your errands so you won't have to carry unnecessary extra weight. Like people – as batteries age, their performance degrades. The full battery capacity will become lower and lower as the battery gets older and older. This is another great reason why you should buy a battery which offers a little more range then what you actually need. The future may rest in new technologies such as fuel cells, ultra-capacitors, or maybe some hybrid combination of fuel cells and electric. Even highly efficient solar cells could maybe one day partially recharge the battery while on the go. Beside the range of a single charge, the total mileage of the battery is also meaningful. That is, how many recharges the battery will sustain before it dies. Laboratory tests indicate very different numbers for various battery technologies. It varies from 200 cycles up to even 2000 cycles. Real life conditions numbers can vary tremendously. Believing the manufactures claims regarding the recharging cycles number. Reading what the technological papers say about different batteries life span. But if you want to simplify things and be on the safe side, you can determine the lifespan simply by the warranty that came with you e-bike. An interesting alternative to consider is a leasing a battery.